Each spring, Sustainability Award winners are selected for outstanding achievement in sustainability on campus, in the community or globally. Sponsored by Coca-Cola, the awards are offered by the Sustainability Council in the following categories: student, faculty member, staff member, campus department of student organization, and innovation/impact. 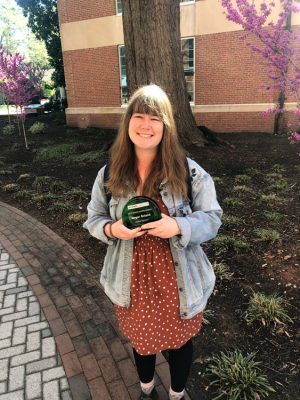 This year Ph.D. student Megan Boland was awarded with the 2019 Sustainability Award. 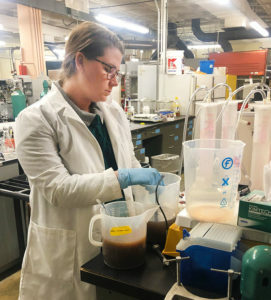 Boland researches anaerobic digestion of animal and agricultural waste, which simultaneously produces renewable energy. In addition to a busy research and course load, Megan joined the NC State Stewards sustainability leadership program. As the Academic Success Coordinator for the Stewards, she provides academic and career mentorship for younger Stewards. She’s also making a difference in her home department. In BAE, where she researches and studies, Megan has initiated and maintains a compost program and is part of the BAE Sustainability Committee. The committee recently won a 2019 Sustainability grant to build and install vertical gardens, rain harvesters and a bee hotel as part of a sustainable ecosystem. See all recipients of the 2019 Sustainability Award.